With a few basic paper-folding skills, you too can create origami swans. For beginners, this model is perfect. In less than 10 steps, the swan is complete. For newcomers to origami, simple models provide everything you need to get started in paper folding. 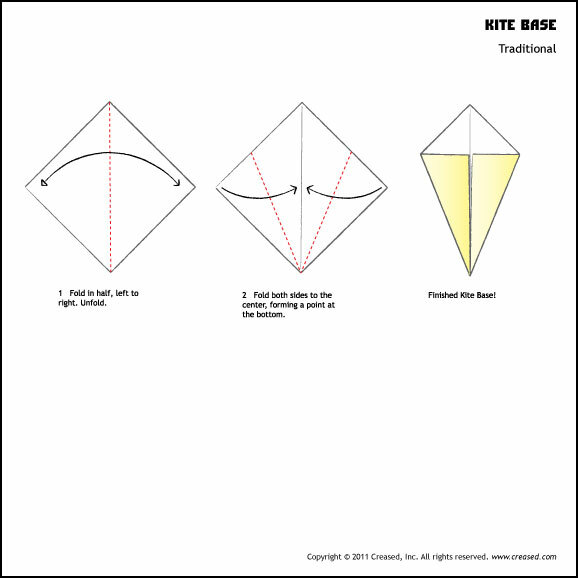 They offer an introduction to basic folds, as well as how to read origami diagrams. What does a dash-line mean? What about arrows? With simple origami, these questions are answered, simply. All origami books, kits, and packets of paper come with a crash course explaining how to read diagrams. For simple origami, like the origami swan for beginners, you'll primarily be dealing with valley and mountain folds, which are defined by the dash and the dash-dot-dash respectively. What's more, arrows indicate the direction of the fold and a solid line means to crease. With this basic knowledge, you're ready to tackle some folds. Most origami models are comprised of valley folds and mountain folds. If you have ever folded paper, chances are you've already made these basic folds countless times. Another way to think of these two folds is as concave (valley) and convex (mountain). Here are some photos of these folds so you can see the difference. The origami swan is a perfect model for novices. Fewer than 10 steps is all it takes to create this elegant design. A 3" square will produce a swan the size of a packet of sugar. A standard 6" square will create one that fits in the palm of your hand. Valley-fold the lower edges to the center line once more. Crease. You model will resemble a slimmer kite. Fold the bottom point of the model up, so that it almost touches the top. Crease. This is the swan's neck. Next, fold the point of the neck about one-quarter of the way down. Crease. This is the swan's head. Lengthwise, fold the entire swan in half. Adjust to preference and display. Now create an entire family! Tip: To test your ability to read diagrams, try working from instructions that only include diagrams, with no text. You'll find most origami models are self-explanatory, communicating each step with dash lines, solid lines, and arrows. It's also sometimes easier to see someone else fold a model first. This is why origami diagrams are so important. It's literally seeing the model folded in pictures. With the Internet, video tutorials are also available, enabling you to see how each fold is done. Oftentimes this helps, as you can always pause a clip to catch up. It's that simple. For beginners making origami swans, the following diagrams and videos should prepare you to make your very own graceful Trumpeter in no time. Howcast.com: Watch a video demonstrating how to fold an origami swan in less than two minutes and only eight steps. 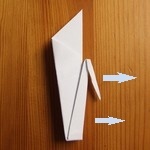 Origami-Instructions.com: Scroll down and find a step-by-step for folding an origami swan. Marcels-Kid-Crafts.com: A photo tutorial designed especially for kids. 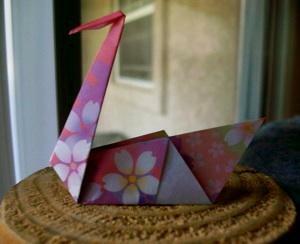 Gilad's Origami: In time, you might make a swan like this, which features a curved neck and rounded body.